2015/16 Lost Bougle – Thick smoke and a big choke! Basil, Felix, Leigh C, Matt and Leroy ventured onto the course, with a day visit from Keith and Ian was deeply missed by all. The weather was ideal, with not too much wind, plenty of sunshine (to bring out the raccoon) and a little cloud to finish off. Matt’s rookie year was a good start to the Bougle campaign, with a few pars and some great shots throughout the torny and a promotion; he won’t be playing off 36 for longJ. Matt also gets a special mention for the barristering effort across the weekend – styling us out with great coffees. Leigh C finished at 1 under his handicap to take the lead with a birdie on the 3rd due to an awesome drive through the gap between the bunker and the trees, followed by Leroy, Basil, Matt and Felix. 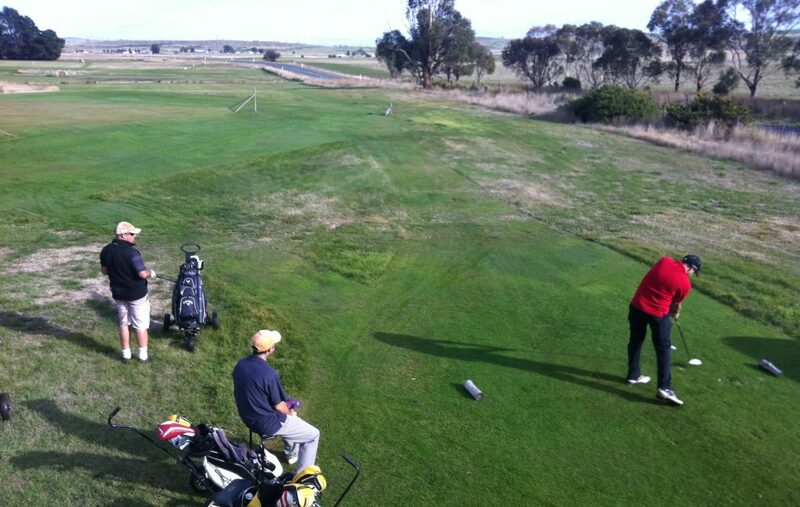 Matt put up a candidate for the fluffy duck on the 15th with a right angled tee shot onto the beach. Leroy played to his handicap on the back 9, after a bit of a dodgey start. Felix played to his handicap to charge up the leader board into 4th place with some great clutch putting, Leigh C played well to 2 over his handicap to retain the overall lead with plus 1. Leroy went 5 over through the first 13 holes but then bombed the rest to finish at 20 over for the day, including a candidate for shot of the torny – with a chip in from the bunker next to the 8th green to make par. Bas and Matt played steady. Leroy birdied the 7th with an approach to within 2 feet of the hole. Basil finished strongly by playing to par for the last 6 holes. Leroy started the day 13 shots behind the leader and played steady all day (playing to his handicap on the front 9), slowly catching the leader. The highlight was a par on the 8th. Leroy and Leigh C drew level on the 11th and then went head to head till the 18th. Basil birdied the 14th, Felix and Matt also bombed awesome drives to be near the green, although Felix copped an unlucky bounce into the bushes. On the 12th Leigh C found the grass on the left, then the fairway bunker on the right and then the next fairway bunker and then the green. Leroy jumped to a 2 shot lead with a steady bogey. On the 13th Leroy hit the green in reg to make par, Leigh C was just over the back and 3 putt bogey, to take a 3 shot lead. On the 14th Leroy duffed chip shots to be in the bunker and then chipped out for a double bogey, Leigh C craven wedged to be near the pin for 2 and made an easy par to reduce the lead to 1 – game on. On the 15th Leigh C found the bunker on the left of the green and Leroy was just short of the green. Leigh C bunker shot rolled off the green and then craven wedged back on for a 2 putt, Leroy made bogey to extend the lead to 2. On the 16th, both gents played splendid shots to make par and no change on the leader board. On the 17th Leroy found the bunker on the right and chipped out to make bogey, Leigh C was just short of the green and made a bogey, to go into the last needing to gain 2 shots. On the 18th tee, Leigh C clunked a couple of tee shots and scrambled to the end, Leroy played steady to make a bogey and take the trophy. Leigh C had one of those days where not much went right, but not much went wrong either, just unlucky. Cravo smoked the field on Days One and Two at the Bougle this year. A minus one at Lost on the first day and plus two at Barny on day two: to be +1, and holding a 10 shot lead heading into the Final Round. Leroy could’ve made things a lot closer if he had’ve closed out his Day Two round at Barny. He was +5 off the stick after 13, but went 15 over par in the last 5 holes. On Day Three Cravo just wanted it tooooo bad, and had a massive meltdown, and then everything that could go wrong did go wrong. Notwithstanding a clutch par on the first (including lost ball), he simply melted away to hand the title to Leroy. Had a mini fightback after giving up the lead, and was two shots down on the last tee before topping his first two drives about 3m into the bushes, throwing a massive sweary tantrum and then cutting a forlorn firgure, head in hands sitting on his buggy on the 18th fairway. Leroy shot his best score at Lost on Day 3 to secure his 3rd Bougle title – and just beat Bas who stormed home by being even off the stick for the last 6 holes. Well done Leroy, and let’s see how Cravo goes this year. He was pretty destroyed until his daughter Genevieve gave him a big hug when he got back home. Bring on the 2016/17 Bougle he says! Posted on August 15, 2016 February 4, 2017 by Gentlepersons' World Golf Tour, Tasmania	This entry was posted in golf and tagged barnbougle, fires, golf, lost farm, majors, strokeplay, tasmania. Bookmark the permalink.